* Aluminum alloy table vise. * Widely used, convenient and easy to use. * Usage: manual manipulation, family and outdoor operation. of your work table or bench. * Suction base: the suction base can be suction on any smooth surface. 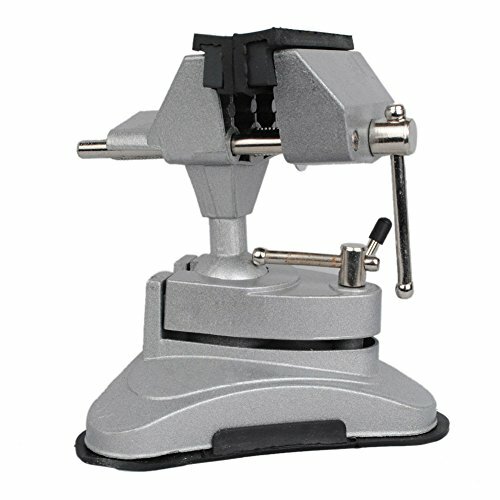 This Mini Vice with vacuum based can be used anywhere you need it! All you need is a flat surface and the powerful suction mechanism can attach quickly and securely so you can get to work. sing a socket and ball joint system, the head of the vice can be rotated a full 360° and pivoted 90° so your piece can be maneuvered without having to release the jaw pressure.